This attractive salad is packed with a lot of heart healthy ingredients and requires very little cooking time. Salmon and sardines are high in omega-3 fatty acids, which research shows can boost heart health, lower triglycerides and may help with rheumatoid arthritis and depression. Olives and olive oil can help lower LDL “bad” cholesterol, maintain levels of HDL “good” cholesterol and protect against heart disease. Avocados are also heart-healthy, a good source of fiber, potassium and vitamins C, K, folate and B6. This salad is very easy to prepare and the ingredients can be exchanged depending on what you are in the mood for. Any variety of tomatoes can be used. 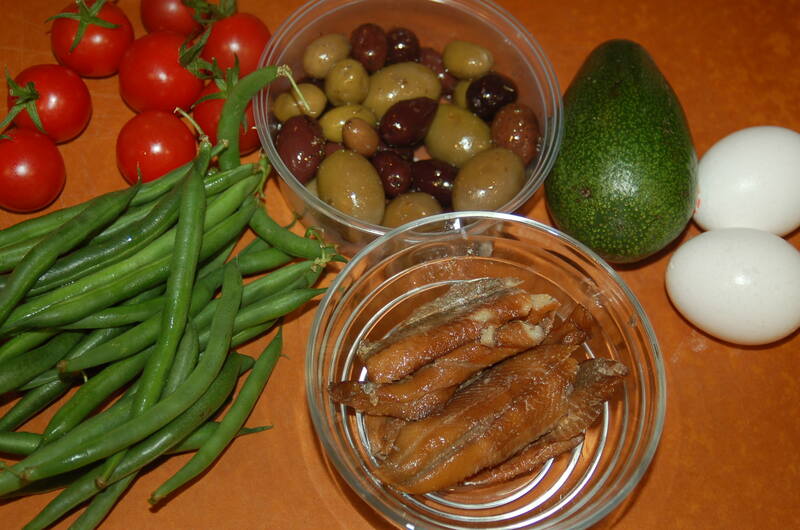 The avocado can be replaced with blanched string beans. For more complex carbohydrates, small boiled potatoes can be added. Whisk together Dijon mustard, soy sauce and 2 tablespoons of olive oil. 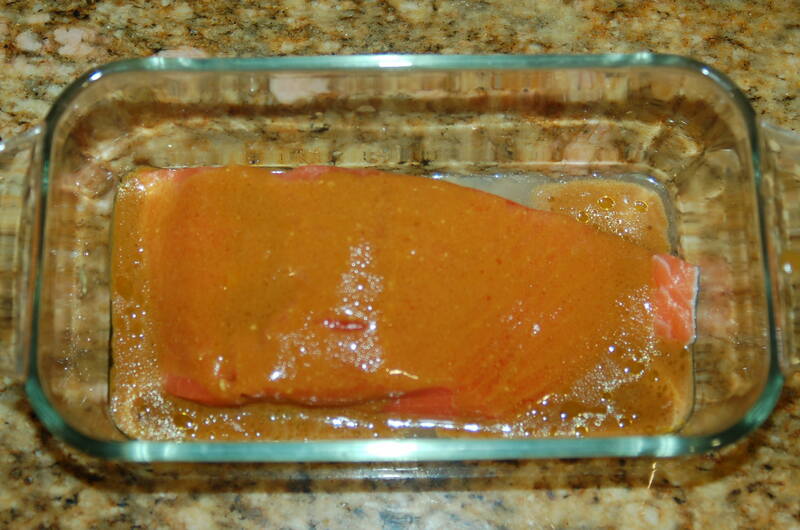 Pour over salmon and marinade for 10-30 minutes. Boil eggs. I prefer soft boiled which I achieve by placing the eggs in a pot of water, then bring the water to boil. Allow the eggs to sit in the boiling water for 2 minutes, then turn off the heat, cover the eggs and allow to sit for 3 more minutes. Rinse the eggs in cool water and then place them back into the pot with cold water. Line a jelly roll pan with aluminum foil, and spray with nonstick spray. 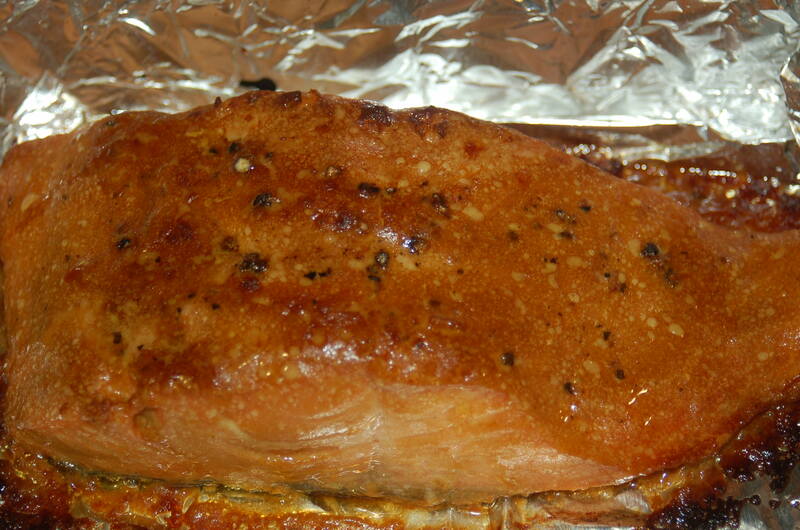 Crack fresh pepper over salmon and place salmon skin side down Broil the salmon in the pan, skin side down, for 8-10 minutes. 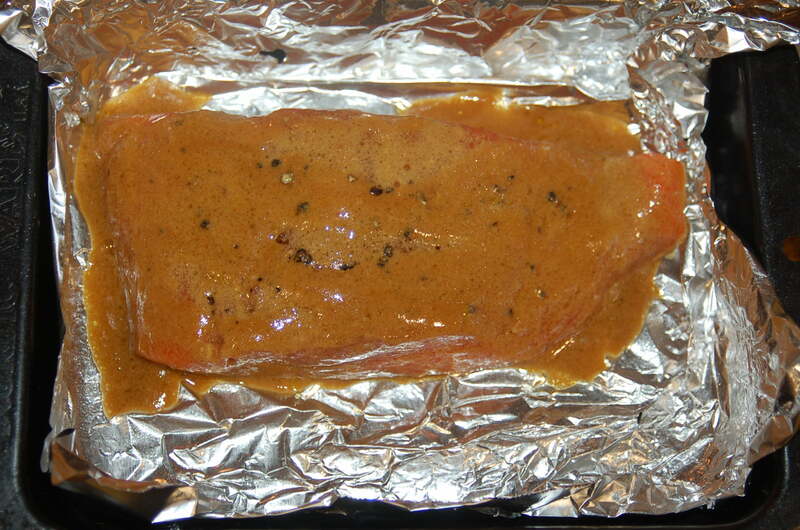 The salmon skin should be easy to remove and recommend you do this before plating. 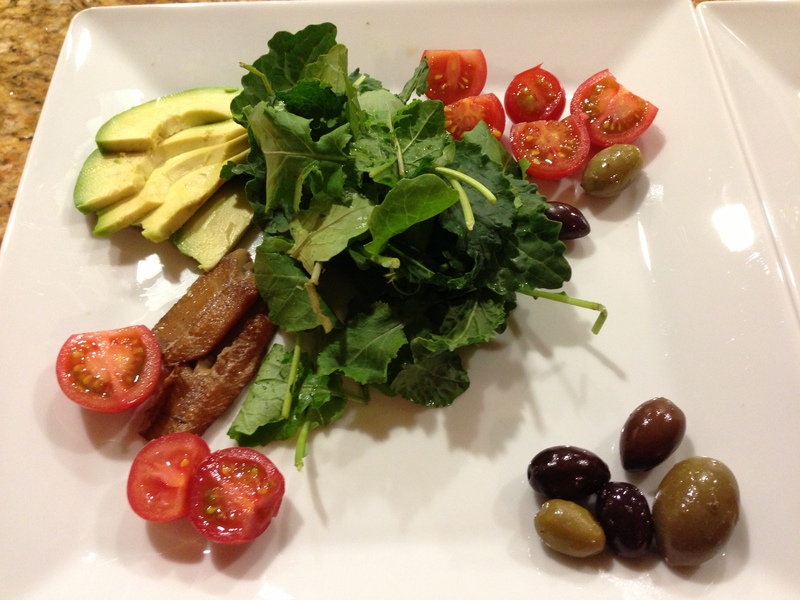 Prepare the salad dressing by whisking together balsamic vinegar, ¼ cup of olive oil with a pinch of Kosher salt. Arrange all ingredients on a plate and drizzle ablout 2-3 teaspoon of salad dressing over lettuce, tomatoes and other vegetables. Take care to arrange your plate. We eat with our eyes first, so presentation is key. We eat with our eyes and taste with our nose too. When entertaining, I always take a moment to think about presentation. 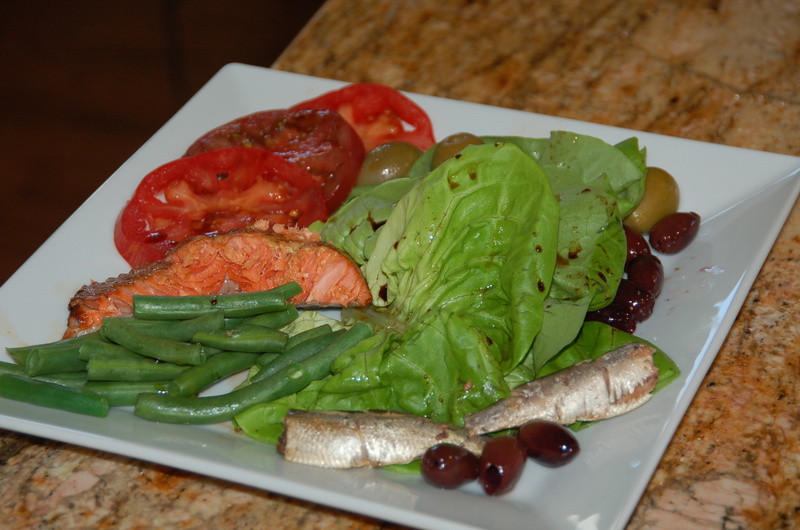 Nicoise Salad with heirloom tomatoes, string beans, butter lettuce, olives and sardines. 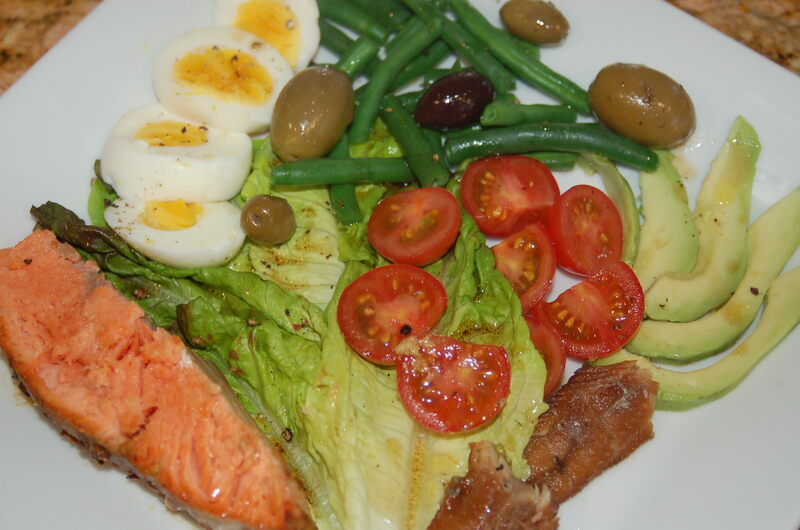 Salmon nicoise salad with cherry tomatoes, string beans, sardines, olives, avocado and soft boiled eggs. 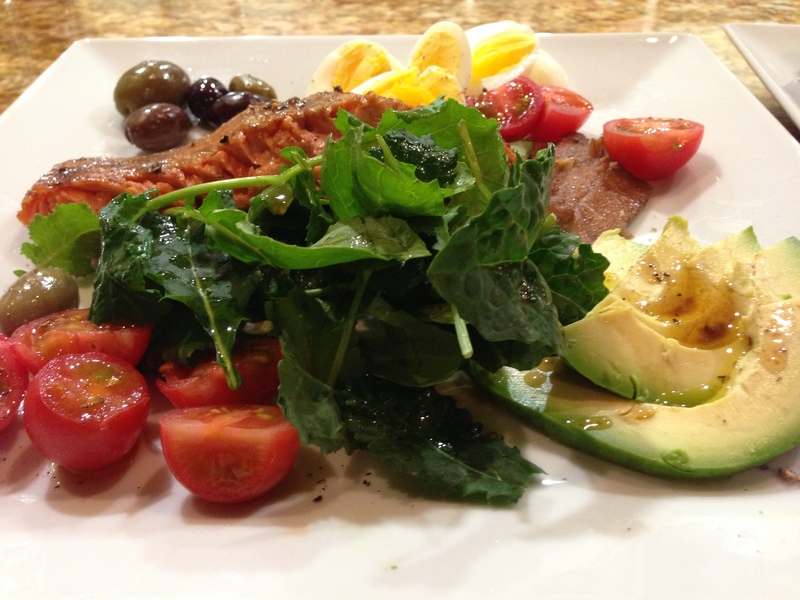 Nicoise salad with kale, avocado, cherry tomatoes, sardines, eggs and olives. It doesn’t get much healthier than this!